I am a mechanical member for the RoboLancers. I have previously participated in several engineering and design competitions (not robotics) since around fourth or fifth grade, so I have some experience in engineering in design. I have participated in the FIRST Tech Challenge for one year as part of Team 5320, RoboLancers Gold. I have since "graduated" to the higher FIRST Robotics Competition. 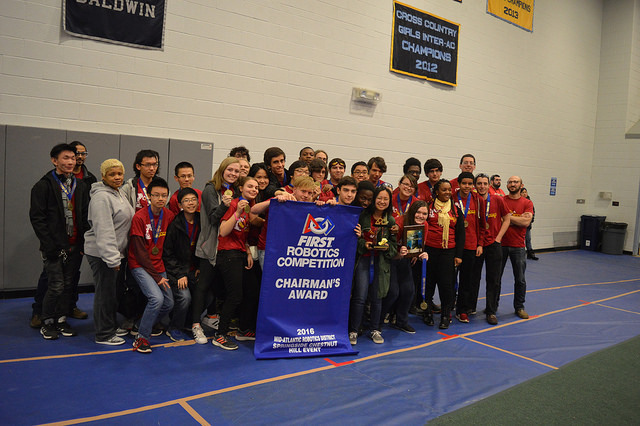 On March 18th and 19th, the RoboLancers competed in our first FRC qualifier of the 2016 season at Springside Chestnut Hill Academy. At 8 AM, Team 321 entered the pits and stands. The spectators “conquered” (as we like to say) a portion of the stands, while the pit crew entered our pit to prepare our robot for competition. Our drivers for this season include Cordell Beatty, current senior and robot driver, Brian Matta, senior and manipulator controller, and Jonah Getz, junior and coach. Our robot and drive team performed reasonably well for the first five matches, receiving a respectable 2-3 win-loss ratio. When our 6th qualifying match (qualifying match #30) came about, our robot failed to connect to the system and the drive team was unable to control the robot. We were given little time to correct this error because, for the next two matches, we were required to queue for our next match right after finishing the earlier. We corrected our robot connection issue by replacing our router before our 9th match (qualifying match #47) and redeemed ourselves by winning two matches, losing one, and tying in our last qualifying match. We were not chosen to take part in the quarterfinals but, in the semi-finals, we were substituted into the game in the place of a malfunctioning robot. We played one last match alongside our close friends, Team 1218, Vulcan Robotics, but lost to the opposing alliance. 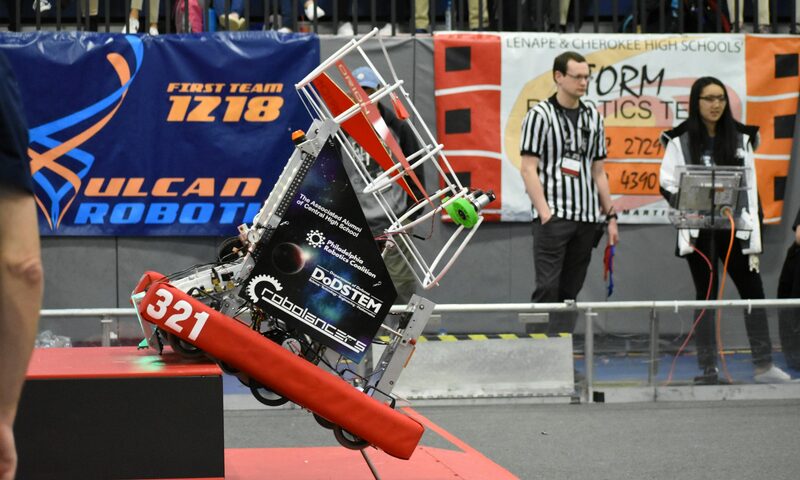 After our final match at the Springside Chestnut Hill Qualifier, our team continued to maintain a positive attitude in the stands and cheered on as Team 225, our friends and fellow competitors, and their alliance won their elimination matches and the finals. The day ended with a trip through the High Five Line for winning the Chairman’s Award, the most prestigious award in FIRST Robotics. This ensures us a place in the FIRST Mid-Atlantic District Championship where we will again compete for the Mid-Atlantic Region’s Chairman’s Award and a chance to compete in the World Championships in St. Louis.